In 1911, Belgian industrialist Ernest Solvay convened an invitation-only conference of some of the greatest minds in the world to address the subject, Radiation and the Quanta. The event was held in Brussels and was to brainstorm on the problems of having two different approaches to science. At the time, classical mechanics, or Newtonian mechanics, were focused on the physical world and studied the motion of bodies under the influence of a system of forces. However, classical mechanics became inaccurate at very small scales and high velocities. Because of this, a revolution was taking place. Quantum mechanics focused on nanoscopic scales, theorizing mathematical descriptions of the dual particle-like and wave-like behavior of energy and matter. The problem was simple: matter did not seem to behave the same on the smallest of nanomicroscopic levels as it did in the physical world of hard bodies in motion. In 1911, Albert Einstein was the second-youngest scientist in attendance for this turning point in the world of psychics. At 32 years old, he was mingling around with the likes of Madam Marie Curie, who was pioneering the research on radioactivity, and Henri Poincare, famed French mathematician, theoretical physicist, engineer and philosopher of science. What a heady meeting this must have been. The following year, the International Solvay Institutes for Physics and Chemistry was founded and organized several more conferences to debate the pressing issue this quantum revolution was causing. The third Conference, held in April 1921 after the defeat of the Germans in WWI, banned German scientists from attending. Einstein boycotted the event, standing in solidarity with his fellow countrymen. Fifth conference participants, 1927. Institut International de Physique Solvay in Leopold Park. 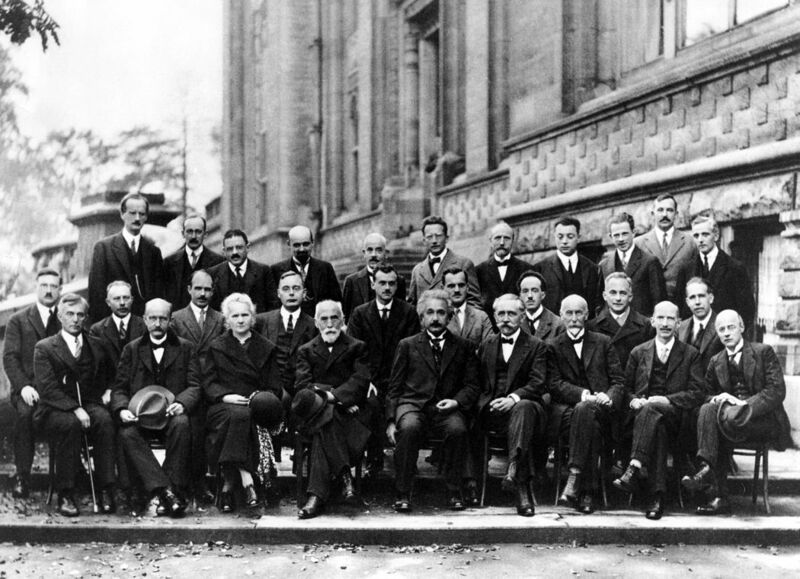 But it was the fifth Solvay Conference, held in Copenhagen in 1927 on Electrons and Photons that is considered the most famous of all Solvay debates. In one corner was Albert Einstein, representing the scientific realists, who wanted to adhere to strict rules of scientific method. In the other corner was Niels Bohr, representing the instrumentalists, who wanted looser rules based on outcomes. Again and again Einstein presented his thought experiments that disproved the instrumentalists’ interpretations. But Bohrs would sleep on the matter and the following day successfully contradict Einstein’s assertions. In the end, the quantum won, and Einstein would spend the rest of his life looking for his own theory that unified the microcosm and macrocosm. As I have been following Einstein’s footsteps around Europe, and especially here in Copenhagen, I had a revelatory insight into my own work with my Imagined Einstein. The real Einstein was giving it away, sharing it freely. It was all about having an open dialogue. And in the exchange and expansion of ideas, they moved culture forward into greater understanding of itself. Sitting here in Copenhagen, imagining how profound the Einstein-Bohrs debates must have been, I am inspired to do the same. I have decided to waive any fees to come to my Conflict REVOLUTION presentation. Instead, I invite people to come and debate these theories I learned from my Imagined Einstein. See the unified field theory and our maps of human consciousness. Listen to the process, experiment with it in your own life, and tell me what you think it is. If you don’t believe in Afterlife, or feel it’s too nutty to admit Einstein might be talking to me from a pure energy state, then feel free to believe I made it all up. But before you dismiss it out of hand, come and see it. Join me in Copenhagen, December 13, as I train Conflict REVOLUTION and channel Einstein. Doors open at 11 AM. I would love to see you there and hear what you think of these revolutionary ideas. Can’t make it to Copenhagen? I encourage you to explore the many topics of Einstein in my Training Series. They’re all on sale until the end of the year. Interested in a Conflict REVOLUTION Workshop or speaking engagement in your area? Contact me. And stay tuned for the next teleclass series that will begin in January 2015.